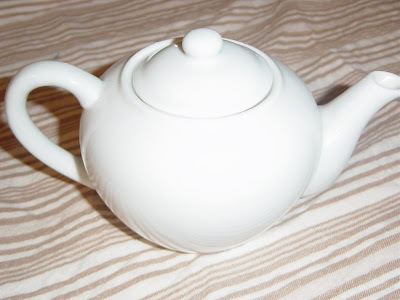 I love teapots! 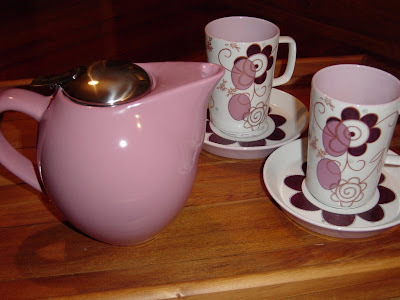 One of my latest additions is this beautiful pink teapot I found hidden away in a store on the sales shelf! Takes loose leaf tea... very cute. I also love my tiny white teapot, just the right size for a tea party for two! OOo that pink one with the cups!!! DIvine!!! I am currently trying to find "the right" tea pot .... I've come close, but so far not quite there. Maybe I should just buy a few not so reight ones and together they'll satisfy my afternoon cuppa needs. That pink one is just too cute. What a find!